Zaria was taking her nap in the noisy living room. We were playing different types of music so Zara could dance to it. We had Jackie Cheung blasting one minute, Eva Cassidy singing Somewhere Over The Rainbow next, then Carly Simon’s Itsy Bitsy Spider. Zaria slept through the noise, not even a stir from her. We then changed the CD to Vivaldi’s Spring. We saw Zaria responding to the tune. She opened her eyes, listened a bit, blinked, then rubbed her eyes, and she started turning around, trying to find the source of the tune (the speakers) sleepily. It seemed she’s remembering the tune, which I played to her weekly (I have 7 sets of clasical tune which I alternated daily) with an mp3 player since I was four months pregnant with her. She rolled to her stomach and liistened without moving for half a minute before wriggling about again. Ever wonder if a babies could recall things that happened when they were in their mother’s womb? I think they can based on this experience. True enough, the milk is a little salty just like mucus. I’m going to pop soon, and here is what we’d been doing, to spend time with Zara as the only child before the arrival of no. 2. Eve of Christmas Eve : We had dinner at Eat Work Shop, and I had my roast turkey! It was good! The owner, Marcia, even threw in the turkey wing for free! After that, we took Zara to hotels (The Saujana and The Holiday Inn Glenmarie) to check out the Christmas decorations, and she really had a good time, since these 2 hotels were very spacious and quiet, and she can run around freely. Christmas Eve : The big family dinner was supposed to be 3 tables at a Chinese restaurant. 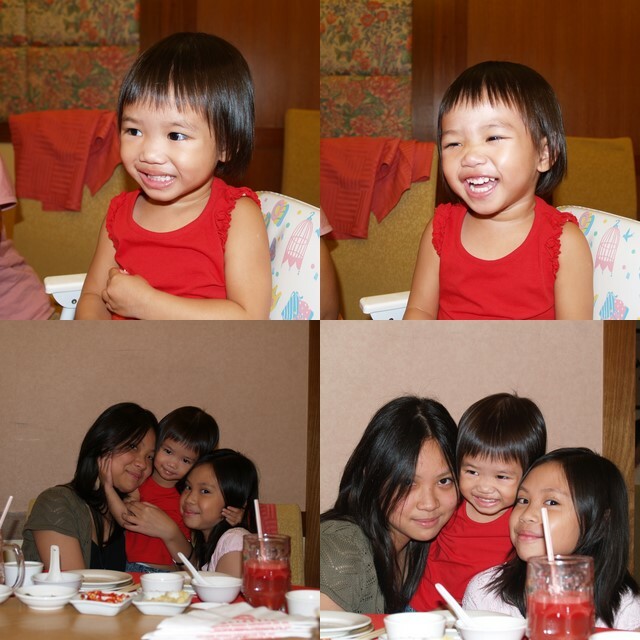 My eldest sis decided not to join us and my youngest sis got admitted for dengue fever the day before. So the dinner ended up being a small one, with only King’s Wife’s family and ours with my dad. Dinner was err.. cut throat price in Overseas Restaurant and not nice at all! 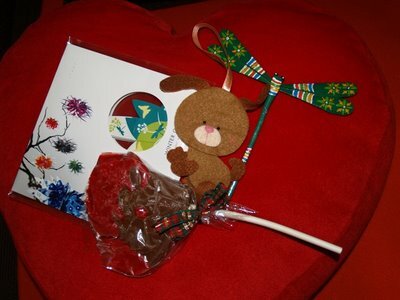 After dinner, we adjorned to the hospital to visit my sister and open up our presents together with my sister’s family. On Christmas Day : Zara was kept busy playing with her Christmas presents in the morning. We then went to have lunch with my dad, and later dinner with Daddy’s friends. Whole day of eating and outing! On Boxing Day : Daddy went back to work. I brought Zara to Kidzsports with Tuyam and then to the Pet Shop, per the requests of the little girl. Bought myself the Allerhand bag (Christmas present from Daddy), and end my hunt for the perfect bag for carrying Zara and baby’s things. Best of all! Zara and I are both very happy to receive these from Domestic Rat and May. Thanks Ladies! Zara loves the doggie; I believe the Chocolate lolly was supposed to be a raindeer, but it has melted. 🙁 Zara was however, very keen in tasting her first lolly pop. I’ll be going in to the hospital on Thursday to get induced. Today (Wednesday) will be my very last day spending with Zara before the arrival of baby. Some how, I feel a bit melancholy. After this, she will no longer be my only child, where all my energy and attention has been channeled to the last 2 years. Wish me a safe and quick delivery, will you? We had very bad experience with our first confinement lady (CL) when we had Zara. Being extremely unhygenic (picked nose then applied diaper cream on Zara; dipped a spoon into her mouth to taste her own cooking and then using the same spoon to stir the broth later), totally non supportive of my breast feeding plan (when Zara cried because of hunger, she started chanting, “aiyo, girl girl ah, mummy naughty ah, don’t let you drink powder milk ah“, as though I wasn’t already stressed enough) and rough (the thumping sound she made when she burped Zara was heart breaking); she got the boot the 2nd day. 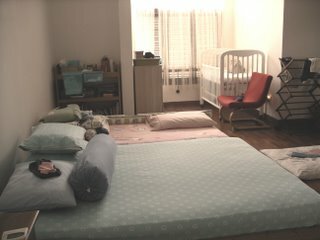 I took care of Zara on my own (no MIL to offer help, didn’t trust maid with Zara) with a few visits from the hospital nurse to teach me how to bath and care for Zara. We are trying our luck the 2nd time this round. Since I only started looking for one after I got my amnio result (into 5th month), we were not left with many choices (better ones were already hired). I haven’t met the CL, don’t know what she looks like, how she is. Daddy is extremely skeptical about leaving baby at night with the CL alone in a room for that one month. Since I’m going to breast feed anyway, we plan to have the CL sleep with me in our room, while Daddy takes the guest’s room. The thing is where will the CL sleep? On our queen size bed with me? Err.. I don’t think I want that. On Zara’s bed? Hah, here is what Zara said when we tried to ‘negotiate’ with her. So, here is our plan, we’ll be setting up another single bed in our room near the cot, and have the CL sleep there for that month. Have a look at the room now, it’ll turn into a dorm when the other bed is moved in! 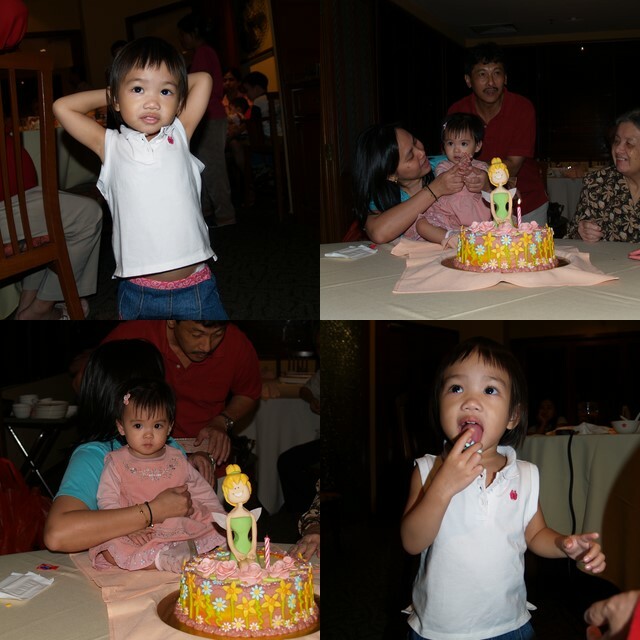 Tasha (my eldest sis’ daughter) celebrated her 1st birthday on Saturday in Cocca Restaurant. The thing is, Zara never wanted to admit it’s Tasha’s birthday. When we told her we’re going for Tasha’s birthday party, she said, “No, it’s Zara’s birthday!”. When we asked her to pass the present to Tasha, she said, “No, it’s Zara’s one!”. She didn’t want to give Tasha a hug, or wish her Happy Birthday. She didn’t even want to join in the other children for a group photo. Hmm.. at this age, she is really not showing much interest to kids her age or younger than her. Maybe it’s the competition (for attention) she finds unsettling. She stuck to her older cousins all the time, joining in their games. Playing with her cousins; Tasha with BIL and sis; Tasha and her Tinkerbell Cake; Zara attacking the sugar flower on the cake. On Sunday, we were invited to my neighbor’s daughter, Cayley’s full moon party. My neighbor’s older daughter Chloe (the same age as Zara), is Zara’s play mate. They seem to have this love hate relationship. They want to play with each other, and yet, they can’t share toys, and sometimes even have the occasional shouting bout. E.g. “It’s mine!” “I take (took) first!” etc. Daddy and I were busy stuffing ourselves silly with all the lovely home cooked food, while Zara made herself at home playing with Chloe’s toys (she’s been to Chloe’s house a few times, and knew where Chloe’s toys were kept). And true enough, to my relieve, she didn’t do any snatching or fighting with Chloe. I’m trying to get all my cravings fulfilled before I give birth and start the herbs, wine and ginger confinement diet (blech). The next item on my list, Turkey! I’ll be starting my leave next week, back at work on April 1st. Lots to clear up before the long leave! Pregnancy Update – Baby coming soon? My stomach is extremely huge, I have slightly more than 3 more weeks to go. Resting is no longer possible. Laying on the right or left no longer feel comfortable. Sitting hurt my back. Standing tires my calves. I wake up middle of the night with eyes wide opened, trying hard to go back to sleep. Baby is still active although with not much space for movement, we can see the tremors she creates when she moves, skin stretching before our eyes. 1) ordered my confinement herbs and herbal wine from my Chinese Dr.
2) confirmed with friend’s mum who will be supplying me with home brewed rice wine. And yesterday, I’d even packed my bag for my hospital stay. So now, I’m just waiting for baby’s arrival. 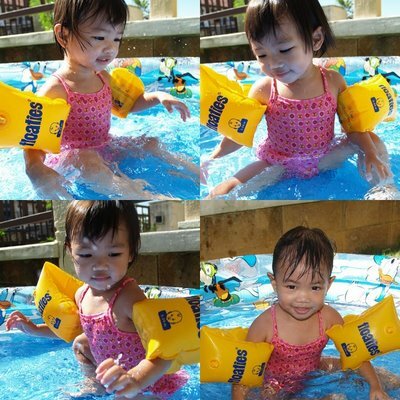 On the other hand, Zara has been bugging us to bring her to the beach, to Morib, to Penang, to Cowboy Town. We had to explain to her I’m too big to be traveling now, and we have to wait for Mei-Mei’s (Chinese : Little sister) arrival before we can travel again. So over the weekend, besides bringing her to the mall, we let her play in her wading pool. She was very very happy, since her last dip was actually in Phuket, quite a while back. I have slightly more than a month to go before No. 2 arrives. There are 2 things which I’m cracking my head with. Daddy and I can’t decide on a name for No.2. We wanted a two syllables name which starts with Z and ends with A. That doesn’t leave us much choice. Daddy doesn’t like my choice of names, and I don’t like his choices. Anybody has any names to recommend? 2nd : What are we to do with Zara when I have to be in the hospital to have the baby? When Zara was born, Daddy was in the hospital with me the 2nights I stayed there. Now, Zara has never slept without either one of us at her side. I’m not sure what we are going to do when I have to be admitted this time. 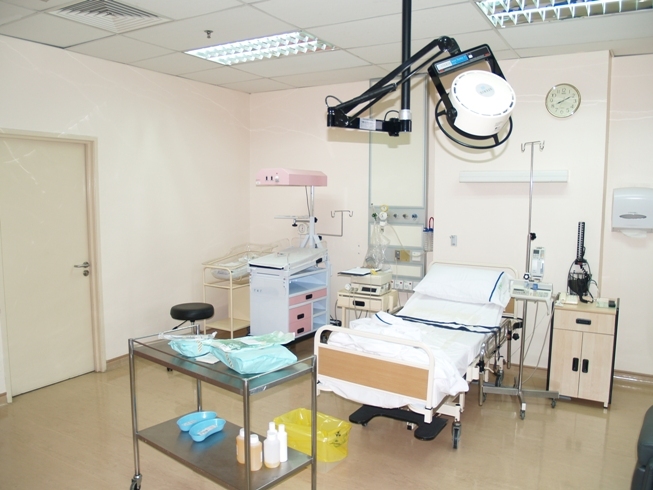 1) Have Daddy stay at home with her, so I’ll be alone in the hospital? 2) Have her stay with us in the hospital together? For those who have two kids, what do you do with no. 1 when you were in the hospital giving birth to no. 2? When it’s time for her evening bath, and if Daddy wanted to bath her, she would say, “Don’t want Daddy. Want mummy do only. Mummy do, mummy do.” followed by crying if we don’t oblidge. At night, only I can sleep next to her. If Daddy stayed on too long at her side after saying good night to her, she would say, “Daddy sleep there (pointing to Daddy’s side of the bed).” or “Daddy go down (from my bed)” If Daddy lied on her bed. Yesterday, when Daddy got her things ready and wanted to brush her teeth (most days I do the brushing), she told Daddy, “Daddy brush la. Use Zara’s toothpaste, use Zara’s tooth brush. Ok? Daddy brush la, use Zara’s water to rinse mouth. Zara don’t want”. I wonder how I will be able to cope with a clingy 2 year old, and a new baby. I have 9 more weeks to go before I pop. Put on 9Kg so far. 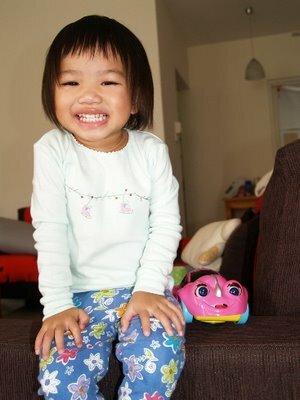 Baby is doing fine, kicking and moving a lot, especially when she hears her jie-jie’s (Chinese : big sister) voice. Zara is reaching Terrible Two and becoming a bit of a handful, very demanding, very whiney (very tiring for mummy). The arrangement with MIL coming to stay with us and babysitting Zara didn’t work out. By day 2, she totally refused ‘Mama’ (Chinese : Paternal grandma), and worst thing was, she started crying from morning till night, unless she’s at my side. Can you imagine how tiring it was for me, especially if I needed to work as well? I took a day off on Thurs and Daddy helped out by working from home on Fri, that made me survived the week. When we asked Zara why she didn’t like Mama, she told Daddy, “Mama no fun”. I think Mama is over protective, not allowing Zara to do lots of things in fear of Zara falling or hurting herself, and then there’s also this communication problem. Mama speaks Chinese, Zara speaks English. but she learnt fast, by Day 3, she started saying “Bu Yao” (Mandarin : Don’t want) every time Mama came near her. Now we’re back to my sis’ place. Zara has accepted one of the Kakaks to play with her (although she still refuses to let the Kakak change her diaper, bath or feed her), so it’s easier on me, and she’s also very happy to have my nephews play with her when they come home from school. My maid will be coming back next Wednesday. Thank goodness. By 11pm every night, after doing a bit of house work and packing Zara’s things for the following day (when Zara has gone to sleep), I can feel my shoulders and back aching. And that’s when I tried to catch up on some work which I couldn’t finish up during the day because of the interruptions from Zara. Work is piling up.. So I’ll be taking a blog break. See you all again when my maid is back. We went for a 3D scan last Thursday, and we brought along Zara, thinking it would be good for her to look at the baby as well. Our Doctor did the scan himself together with a sonographer, and we spent more than an hour doing this. Zara was very chatty throughout, but also got restless after 2mins. When we’re done, she was so glad to say, “Thank you very much! Bye bye, See You” to the Doctor and the sonographer. Ah, I should have brought her some books to keep her occupied. Back to the baby, every thing is ok. Throughout 1hr+ scan, she was moving nonstop. One moment she hid behind her hands, next moment, she hid behind the placenta, another moment she lifted up her legs and covered her face, and then did some kicking motion. She was always on the move. See, if I didn’t know she’s a girl, I would have thought she’s a boy again, based on her activeness. Dr was having a tough time trying to capture a perfect shot of her face. 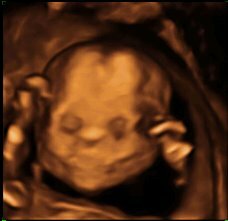 However, we did manage to see she has the same skull shape as Zara, she has rather big and slim feet, she has the same button nose like Zara; daddy said, “Don’t all babies look like this?”, oh well, maybe they do. Most important thing is she’s doing well. As for me, I’m doing fine, big, but fine. Into my 23rd week (coming to 6months), have put on ~6Kg, feel like I’m 8months pregnant, always tired, always hungry. I’m getting so lazy… or maybe I should say tired. Lots of work to do, and these 2 days, I have gone to the office to work and sent Zara and Tuyam to my sister’s place. Zara had a good weekend. When we asked her what she wanted to do in the pet shop, she said, “See iguana, dog dog, cat cat, rabbit, mouse”. So Daddy oblidged, and I told him his daugther has more persuasive power than me. I could never drag him out of bed like that. On Sunday morning, when we stepped out of the house for a walk, we met Zara’s friend Chloe and her mum walking passed our gate also taking a walk. Chloe is 9mths older than Zara, and we always see her in the park. Chloe’s mum is also pregnant like me, so we have lots of things to share, about our daugthers, about our pregnancies. So we went walking together, 2 pregnant ladies with 2 toddlers. After our walk, Chloe invited Zara to her house to play. Zara had a good time there, this is her first visit to a friend’s house. She wasn’t shy at all, digging out Chloe’s toys from her toy box without prompting, playing the slide, jumping on the sofa like it’s her own home. I should invite Chloe over next time but I wonder if Zara will so willingly sharing her toys. She must be so lonely always stuck at home with mummy and Tuyam all the time. And for me, after getting home from my sister’s place, I just feel like sleeping and do nothing.. So I went to bed with Zara at 10pm. Zzzzzzz.